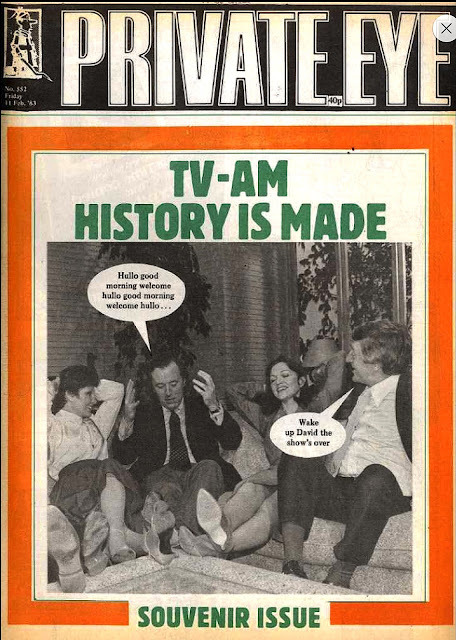 These are two 1983 covers from Britain's satirical magazine PRIVATE EYE, celebrating the early highs and lows of Britain's first breakfast TV service: TV-am. As bonkers as it might sound in today's zillion-channel media environment, I was there (way back in February 1983) for the arrival of Breakfast Television in the UK! We'd only just gained a fourth channel the previous year (and the bulk of CHANNEL FOUR's niche-interest output was pretty-much off-limits due to intense dullness) and regularly-scheduled daytime and overnight services were still years away. Yup, things really were bleak. So the chance to see TV whilst getting ready for school was a real novelty. First on-air was ITV's national service TV-am. Thanks to ITV's unique regional structure, each of the local companies were required to handover their early morning hours to the new seven-day company (hardly a hardship considering those hours were hardly -if at all - ever used). TV-am launched with a (fairly) high-minded service with viewer-unfriendly segments including long and indigestible interviews (conducted by David Frost or one of the other star name "Famous Five" presenters) and - of all things - farming prices. The BBC launched their own, surprisingly informal, alternative - BBC BREAKFAST TIME - a few weeks later and swiftly hoovered-up the small audience willing to watch TV at that time of day. TV-am, saddled with high running costs (the well rewarded "Five", purpose-built studios in North London's Camden and it's own News-gathering service after it failed to strike a deal with ITN, ITV's existing national and international news provider) and hit by a dispute between unions and advertisers (union disputes would haunt the company throughout its life), quickly went into panic mode. By March, it's backers had parted company with its uber-brained instigator Peter Jay. It's new management team also swiftly dumped most of the original presenting team, retaining only Michael Parkinson (hence the cover) and David Frost, although both would be shunted to the weekends with undue haste. In 1987, the company became embroiled in an extended dispute with the broadcasting unions. Technicians walked-out for 24-hour but management subsequently prevented them from returning to work until they signed new contracts. With negotiations at an impasse, and the station outputting a ramshackle line-up of (mostly acquired) programmes staffed by management and non-technical staff, the union members were subsequently fired. That action, against what Mrs Thatcher believed to be one of the last bastions of union power, appeared to win the company friends in high places (and repeats of the sixties BATMAN camp crusader show boasted the ratings). All ITV franchises came up for renewal at the turn of the decade and Thatcher's Conservative government introduced a new bidding system. Now, assuming the applicant reached the minimum quality threshold, the highest bidder would win, regardless of the performance of the current operator. TV-am, now highly profitable thanks to its cheap-and-cheerful programme formula, bid low (inexplicably) believing that (somehow) its programme quality would see off all challengers. It didn't stand a chance. Defeated, it soldiered on for the remaining eighteen months of the contract, slashing costs and staff along the way in a final dash for profit. The last episode of GOOD MORNING BRITAIN, TV-am's flagship programme, soldiered on until 31 December 1992. Its successor, GMTV, took to the air the following morning. Not only was TV-am's garish sofa a comforting early-morning sight for a generation of geeks, it was also a reliable source of (not-entirely-good-for-you) entertainment. 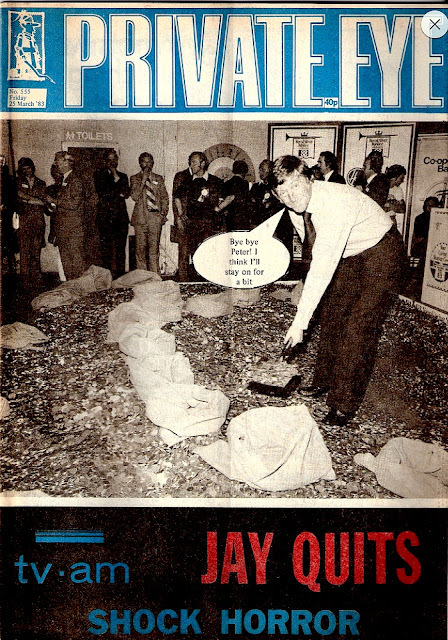 Always watching the pennies, TV-am was fairly shameless in acquiring toy-based animation (THE TRANSFORMERS, CHALLENGE OF THE GOBOTS, M.A.S.K, JEM as well as CARE BEARS and THE GET ALONG GANG) and - as mentioned in previous posts - it also hosted visits from various Marvel US creative types. It also aired the sixties BATMAN live-action show. Initially intended for weekend slots (along with FLIPPER), episodes were swiftly drafted-in to fill the strike-hit weekday schedules.